On Friday morning we went along to the fisherman pitched up on Deal beach to buy some fish. We came away with a lot fish for our money, a heavy bag of Deal’s freshest with about ten fillets for £3. We experimented with a few ideas and came up with three recipes for cooking them. The fish was such good quality and you can really taste it’s freshness. They came gutted, de headed and fillited which made cooking them very easy. We’d recommend getting your fish from the guys on the beach, local, cheap and fresh what could be better. These recipes are really simple and easy to whip up on a weeknight. 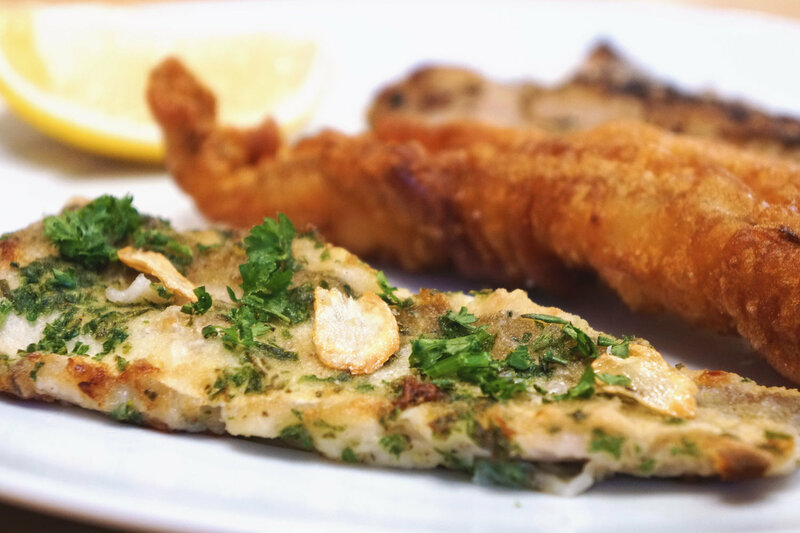 Two of them are even pretty healthy options so you can stick to those new year’s resolutions, but we being in Deal we couldn't avoid the classic fish and chips recipe which will help you break them! 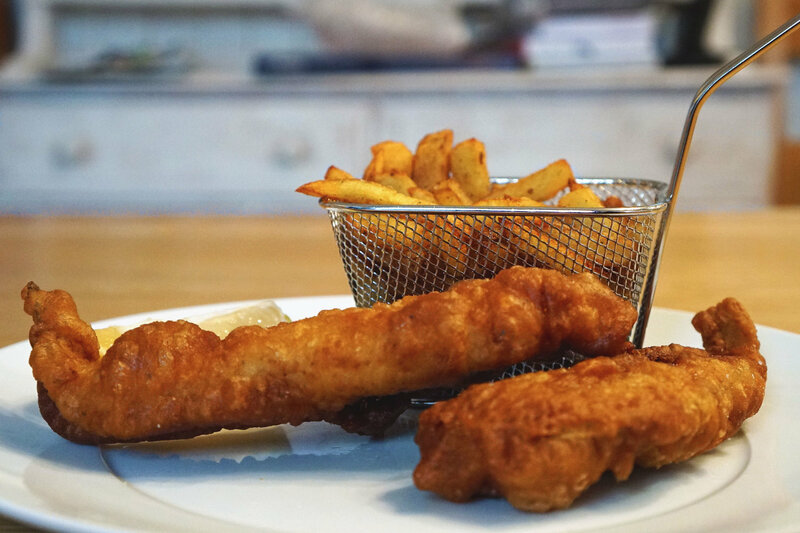 Take things back to basics with this classic beer battered fish and chips recipe. We used a Time and Tide Spratwaffler pale ale, which we bought at Smugglers Records for our beer batter. You can use any beer but we recommend using ale. You can't beat fish and chips from a chippy, but these are pretty close and dare we say it even a little bit more crisp and crunchier. Peel and chop the potatoes to desired preference. Thin cut crisp up quicker, thicker are the classic option. Place into iced water. Heat the oil to 160 C and cook the thoroughly dried chips for 2 minutes. Remove from the oil and leave to cool a little, while you heat the oil up to 190 C. Finally Cook for one minute thirty. Mix the flour with the beer, making sure you have no lumps. Add seasoning and a tablespoon of malt vinegar. Toss the fish in flour and seasoning then dredge in the batter mixture. Make sure the oil is still heated to 190 C. Dip the tip of the fish in the oil for a few seconds to let the batten harden a little, then lay the fish into the oil away from you, let a few more seconds pass as it crisps up then move it around to make sure it doesn't stick and burn. Fry the fish for around four to five minutes or until the batter turns a nice golden colour. Serve with a wedge of lemon and lashings of salt and vinegar. This is a simple one and even better you'll probably have most of the ingredients somewhere in the kitchen. Try experimenting with different herb combinations or by adding a little spice. Thinly slice a clove of garlic and toss in a heated pan with some olive oil. Chop up your herbs and sprinkle some onto a plate. Spoon a little plain flour onto the plate along with salt and pepper. Dredge the fish into the oil and herb coating pressing to make sure it’s coated. 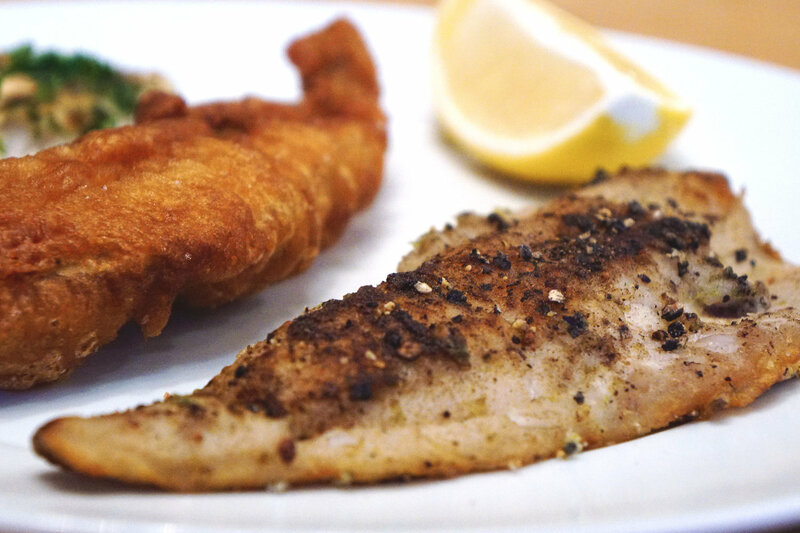 Place the fish into the pan skin first and cook for 2-3 mins or for longer depending on the size of your fish. When it’s cooked serve with a sprinkling of chopped herbs and the toasted garlic slices. Another simple and speedy way to enjoy fish. The peppercorns in this create a nice crunch to the outside forming a kind of crust. They also smoked quite a bit when we were frying the fish, so be careful not to let it catch and burn. Crush up a teaspoon of peppercorns in a pestle and mortar, zest a lime. Add half the peppercorns to the lime zest and a dessert spoon of plain flour. Add salt too. Heat up a frying pan with a little olive oil. Dredge the fish in the flour, and press to make sure it sticks. Place the fish skin side down in the hot pan, wait for 2-3 minutes before flipping with a fish slice. When they’re done, use the remaining peppercorns to sprinkle over the top. The result is a fish dish thats punchy and full of flavour, the lime compliments a subtle fish well and the peppercorns add a hit. Serve flaked into a salad or with new potatoes.